Located within the ‘Paris end’ of Collins Street, 101 Collins Street is widely recognised as Melbourne’s premier office address. Designed by Melbourne architects Denton Corker Marshall it boasts 83,600 sqm of net lettable area, in addition to retail frontages along Collins Street and a grand foyer designed by renowned American postmodern architect, John Burgee from New York. Since 1991, it has ranked among Australia’s five largest office towers and has played a defining role in the character and identity of Melbourne's skyline for more than 25 years. The tower is set back from the Collins Street frontage with a podium level that defines the footpath edge and relates to existing street scale development. The tower is of polished grey granite, articulated by four symmetrical framed glass buttresses projecting from the tower, but stepping back to the façade at the upper levels. The project also included the restoration and conversion of two existing historic buildings. As with Governor Phillip Tower, 101 Collins Street is also recognised as one of the most prestigious and lettable buildings in Australia, due to designs that combined remarkably flexible floor plates with timeless architectural expression. 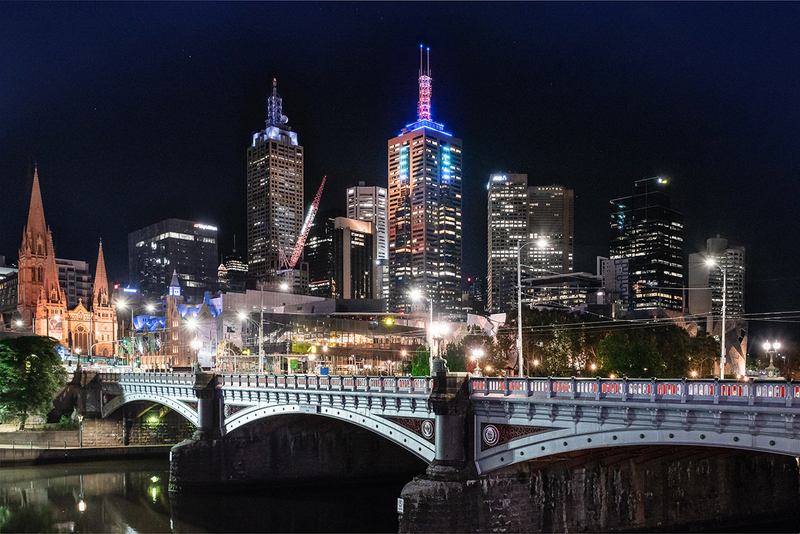 In recognising its status and presence on the skyline, 101 Collins Street will be providing a dazzling new lighting show on the Melbourne skyline every night. This will be achieved via 700m of linear LED - capable of displaying 16 million different colours - extending from the building’s 43rd floor to the top of the 260-metre high spires. Citing the likes of global landmarks such as the Empire State building and the Eiffel Tower, as sources of inspiration, AXA Investment Managers have commissioned an installation which features curated displays designed to reflect changes in season, in addition to major cultural and sporting events, such as the Grand Prix, AFL Grand Final, and the Melbourne Cup. The display was officially launched on Wednesday night (24 October) with a lighting display specifically designed to commemorate the occasion. Daily programmed lighting displays will commence at sunset, transitioning through a variety of hourly scenes before finishing with a ‘moonset’ show at midnight. We wanted to build on 101’s iconic status by creating something that engages with not only our tenants, but with the broader Melbourne community. While 101 Collins is synonymous with Melbourne’s corporate strength, projects like this help bring together the built environment with the creative culture that really defines this city. AXA IM is consistently innovating with new initiatives at 101 Collins Street to ensure the building remains a leader in Melbourne’s fiercely competitive commercial market. The show’s RGB LED lighting technology uses a Philips Colour Kinetics lighting system, making it up to 50 per cent more energy efficient than the energy source its replacing. Designed by renowned engineering firm ARUP, the show uses a 3D canvas for displaying layered content on the building’s different surfaces. To ensure the original architecture of 101 Collins Street is respected, the lighting fixtures will be unnoticeable during the day.